Mahindra Racing has promoted Nick Heidfeld as its new driver for the second season of the Formula E.
After leaving Venturi, Heidfeld joined the Indian team and along with Bruno Senna formed a strong driving pair for the upcoming season. 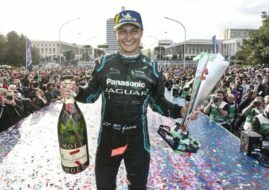 The German racer has joined as a replacement for Karun Chandhok who failed to impress during the first Formula E season. “I am very excited to join Mahindra Racing. It has a reputation as a team with high ambitions. It has a positive outlook which results in them being ready to learn from the lessons of the first season of Formula E. When I tested the new car in Spain, I found that I was with a determined team that shared my passion for racing. My target is to win and I believe that our combination of experience and skills can result in some good results,” Heidfeld said. The 37-year-old driver comes with a lot of Formula 1 experience as he has participated in 185 Grands Prix over the span of his career. He also has competed in the World Endurance Championship in which he achieved some impressive results at the 24 Hours of Le Mans.